So here we go again, another controversy that everyone who takes their politics seriously are talking about. 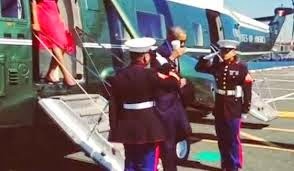 The President steps out of Marine One and gives a half assed salute with a cup of coffee in his hand. Almost before Obama makes it across the tarmac, the far right is going nuts on how disrespectful he is. Following the modern debate protocol, since the people on the far left didn't have a good response, they went with the "oh yeah, well your guy did it too" reply. So here we all are. Arguing who's the worse President based on how they salute members of our Armed Forces. I guess there isn't anything more pressing in the world do discuss. My view is really why are they saluting in the first place. The President is the Commander and Chief, but he's still a civilian and not required to salute back. 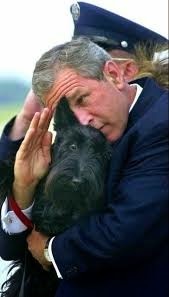 From what I've read online, Reagan may have been the first President to start saluting back the Servicemen. Not sure on that and I'm too lazy to research it for this blog post that nobody will read. If that's true then I guess the Presidents that followed Reagan felt that they were pretty much obligated to do so. While I'm not outraged by this little incident, I did not like seeing the nonchalant approach of President Obama's salute. I say either do it right or don't do it at all, because something in between is disrespectful. With that said, I don't see how it's newsworthy. Being he's been in office for about 6 years now, I'm guessing he's saluted thousands of times now. If this is his worst job, he's still has a good average going for him. As I type this, looking at the two pictures, I can't help but think how much they sum up my views of the two Presidents. Obama appears to be self absorbed and not really caring about whats going on. And Bush is, well..... I guess he's trying.